Edinburgh’s Georgian architec­ture is among the finest in Britain. 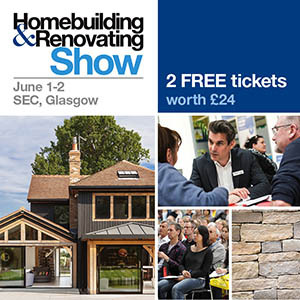 It still surprises me, as a thirty­something Scot, every time I hop through from my native Glasgow and take to the cobbled streets to find the city-centre townhouses, stacked above like stern elder statesmen keeping a watchful eye on the neighbours. The front doors alone, with their fanlights above and classical pillars on either side, are worthy of their own Facebook page. So, it is perhaps understandable that anyone who approaches the council’s planning department with proposals that might alter such beautiful and historically significant streets is met with a flat refusal – the city’s architects are all too well aware of the challenges they face when clients ask them to adapt a Georgian property for 21st-century living. But some have been able to devise solutions that successfully preserve history and heritage while giving the owners homes that suit the modern world. Nigel Somner is one who has mastered that art. He has been in the business for long enough to know what has a chance of being accepted by the planners and what won’t even reach stage one. 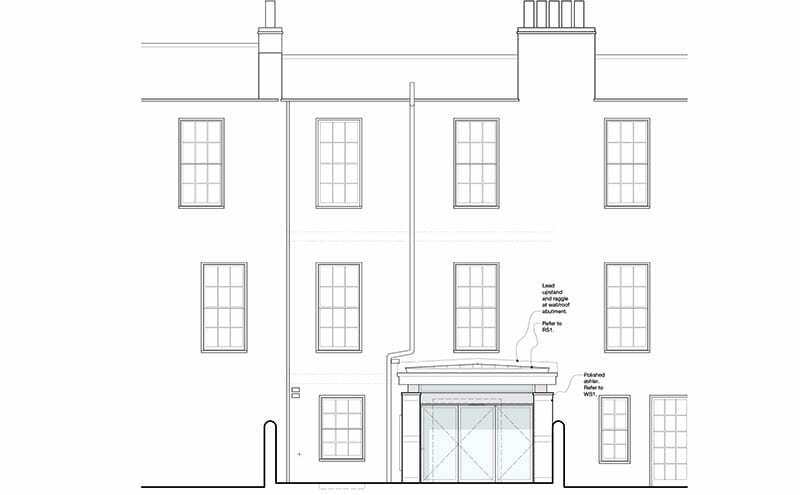 He also knows this particular Edinburgh townhouse inside out: he and his practice Somner Macdonald made alterations to it back in the early 2000s. Even within that brief 15-year gap, though, advances in technology have changed what is possible in building and design. Interior trends, too, have come and gone. What has remained, however, is the reality that people today do not live the same way their Georgian forebears did. Most of Edinburgh’s New Town follows a template: townhouses tend to be arranged over three or four floors, with the first floor being the prime position. This is where the formal drawing room would be, the furniture grander and the decor richer to go along with the higher ceilings and the taller windows. Servants would sleep in the attic and work in the basement, in both cases tucked away out of sight. And it’s this basement level that causes most difficulties to today’s owners, whether they’re in a conversion or they have all four floors to themselves: there is very often a lack of natural light, a disconnection from the garden and a sense of being isolated from the rest of the house. The exterior elevation showing how the extension’s roof is visible from the upstairs windows. These were precisely the issues confronting the owner of this three-storey property, and it showed in the brief: “We were asked to remodel the basement level to create more spacious living areas, with more flow and better connectivity with the private south-facing back garden,” recalls Nigel. 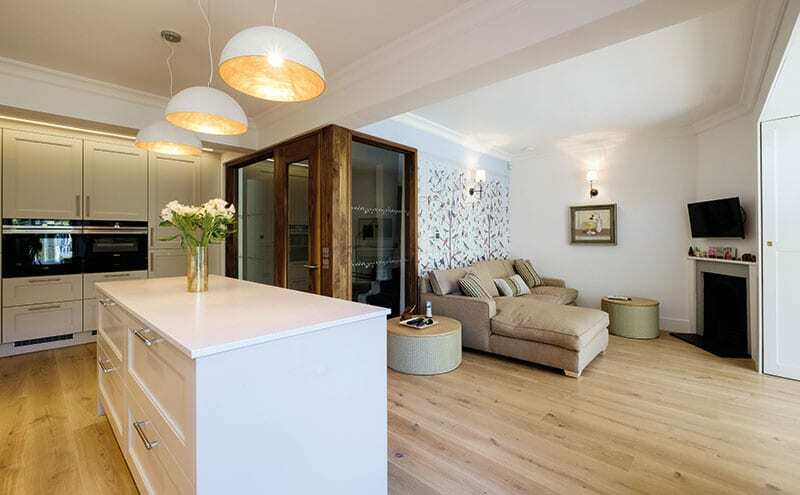 He set about drawing up plans to show how the basement rooms could be opened up to create a large kitchen with a living and dining area, complete with an extension that leads out to the garden. The extension has been designed as a deliberately simple, sculptural structure that sits discreetly, relatively low down, so as not to obscure views or interrupt the original adjoining wall heights. 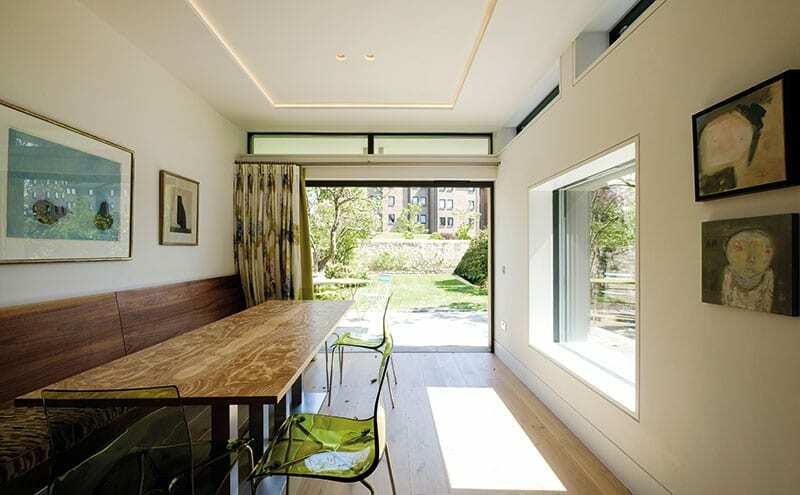 It is constructed predominantly from glass and stone, with sliding glazed doors, a low-pitch zinc roof and several different sizes of window to maximise the light coming in and offer a connection to the patio garden. Linking the garden to the house and opening up the interior to bring in more light. 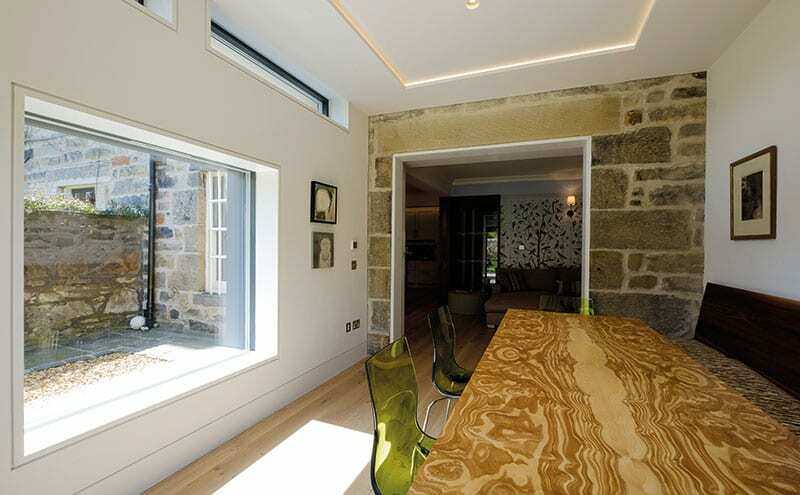 LED strip lighting and pairs of sunken spots create soft, subtle lighting in the extension. The side elevation of the extension, detailing the windows and roof. The roof is perhaps the most strikingly modern part of the new element. 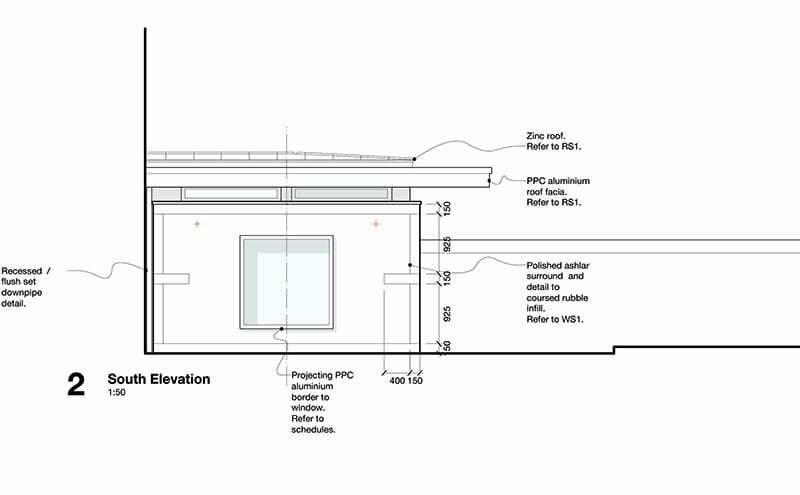 It has been pitched to shed rainwater – a sensible and time-honoured option in Scotland – but, because it is visible from the upstairs rear windows, Nigel knew it would have to be aesthetically pleasing, too. The cantilevered portion acts as a shelter in winter and as a sunshade in summer. 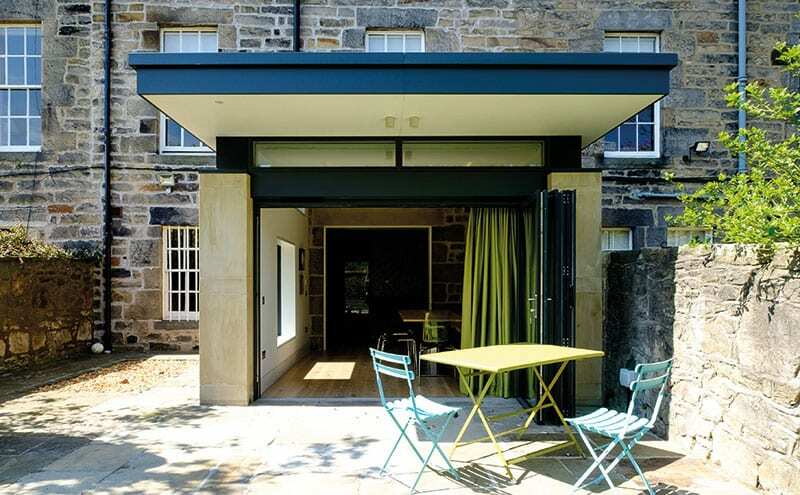 With the bi-fold doors (from Ayrshire Agencies) open, the house and garden connect fluidly, as the client had requested. The island unit helps to define each zone while keeping the area fluid and open-plan. A painted glass splashback adds a bright pop of colour to the muted palette. The Kitchens International kitchen was hand-painted on site and complements the engineered oak floorboards. The pendants were sourced by Bryce McKenzie Design and Decoration. 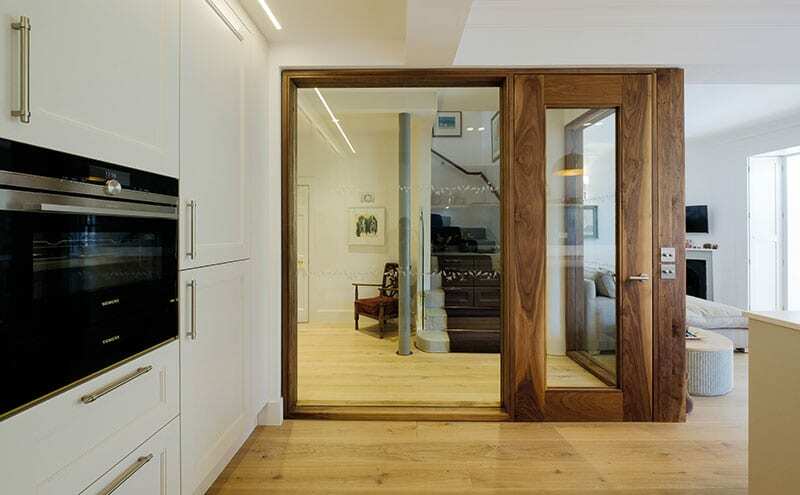 Architect Nigel Somner designed the rich walnut door and screen to allow as much light as possible through to the staircase leading to the upper floors. Bathroom sanitaryware is by Villeroy & Boch, with Crosswater brassware. 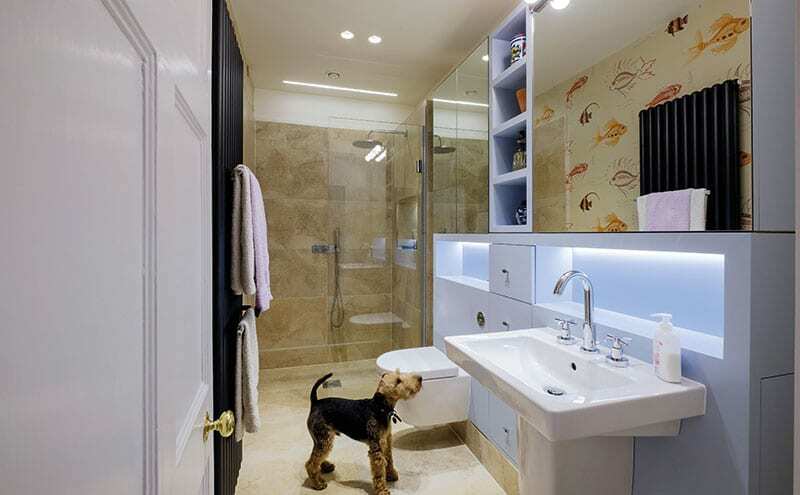 The inset lighting is by Nigel Somner, and the heated towel rail is by Bisque. Here, Nigel used plastered-in downlighters, in pairs, as opposed to scattered single downlights all over the ceiling. LED strips have also been employed, to allow the creation of different lighting moods. 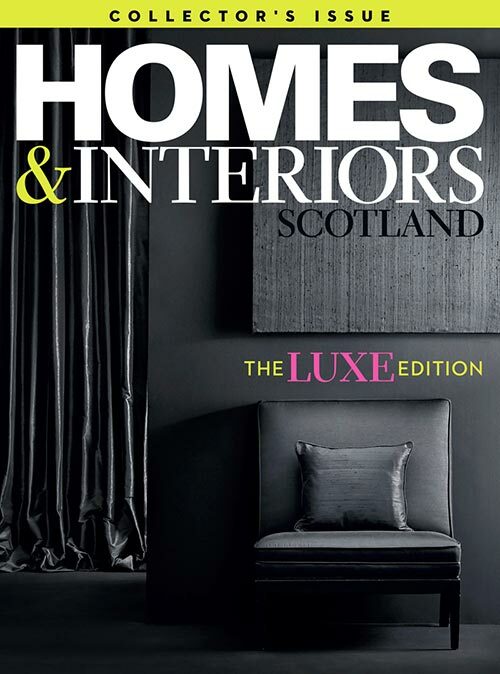 For example, strips have been embedded in the ceiling of the extension and around the perimeter of the kitchen; these emit a soft, atmospheric light that works with the wall sconces of the living area and the three eye-catching pendants (sourced by interior designer Bryce McKenzie, who worked with the client on all the decoration) that hang above the kitchen island. The Kitchens International kitchen is beautifully simple, with a design that is nicely balanced between being neither too modern or not too traditional. Keeping the units to a pared-back white allows other aspects of the decor to take centre-stage – the graceful pendants above the island, for example. 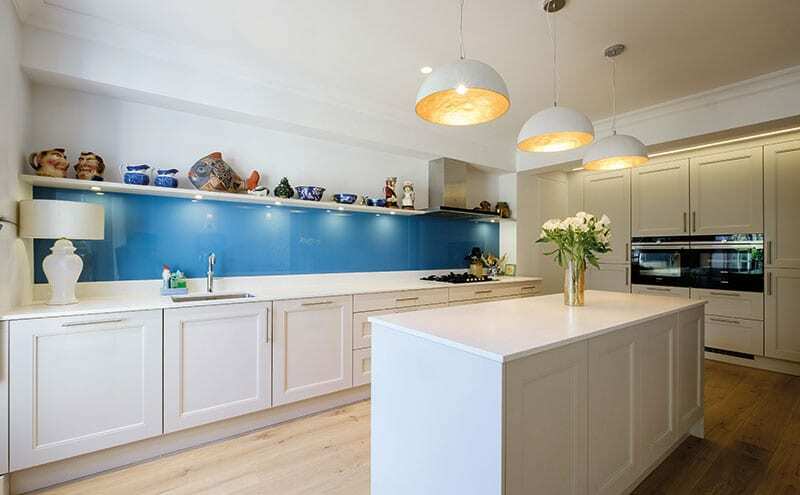 The blue painted glass splashback and the quartz worktop, meanwhile, inject personality to the space, but have earned their place by being hardwearing – this is, after all, a kitchen that has been designed to stand the test of time. The Quooker tap is a favourite with the client, both for its simplicity and the convenience it offers. The pale engineered oak flooring by Russwood com­plements the deeper walnut of the door frame, and the interior furnishings, such as the bespoke dining table with a handmade top by cabinetmaker Michael Hart, speak of the understated quality that helps to make this a timeless classic, much like the Georgian architecture from which it stems.